When Hurricane Michael tore through Florida this past October, it affected communities all along the coast – especially the community of Tyndall Air Force Base, just 12 miles east of Panama City, Fla. – which is exactly why world-famous magician David Blaine wanted to go there. 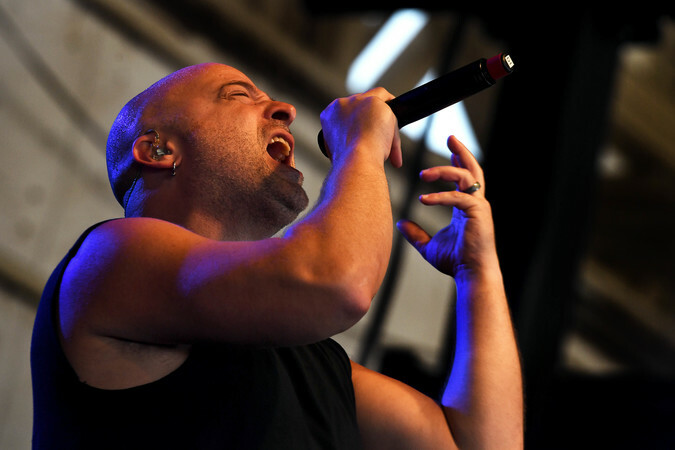 Airmen at Creech and Nellis Air Force Bases in Nevada were treated to two 'amazing' USO concerts from the heavy-metal band Disturbed. Country music star Jerrod Niemann was inspired by his personal experiences of performing on USO tours, and by the tragic fatalities of four U.S. soldiers in Niger in 2017, to write his latest song, "Old Glory." Wilmer Valderrama joined Shaun White, Milo Ventimiglia, Kellie Pickler, Jessimae Peluso, Mat Fraser and DJ J. Dayz for the 18th annual Holiday Tour with the Chairman of the Joint Chiefs of Staff. Valderrama visits with a service member in Norway. The tour made stops in North Carolina, Washington D.C. and Virginia to give private screenings of the new film, Venom, to service members and their families in the area. Tom Hardy spends time with sailors aboard the USS George H.W. Bush. Actors John Krasinski and Wendell Pierce, who star in the new Amazon Prime series, "Tom Clancy's Jack Ryan," visited with service members during Los Angeles Fleet Week on August 31. Krasinski and Pierce chat with a sailor at the Bob Hope USO Fleet Week pop-up center. USO, FOX Sports and the St. Louis Cardinals brought the Missouri National Guard 35th Engineer Brigade in Kuwait closer to home with a special viewing of the August 15th game and an opportunity to connect with their family and friends in attendance. Bonnie Brackett, center manager at USO Camp Buehring, chats with FOX Sports Midwest during their This One's For You broadcast. Actresses Tichina Arnold and Tisha Campbell-Martin, the dynamic duo from the popular 1990s sitcom “Martin,” hosted a “Girl Talk” workshop and meet-and-greet event for military spouses at Keesler Air Force Base, Mississippi. Arnold and Campbell-Martin pose with military spouses on July 7, 2018. Atlanta Falcons CEO Steve Cannon, head coach Dan Quinn, players Alex Mack, Ben Garland and Matt Bryant, cheerleaders Brianna Stade and Alexandria Giannini traveled on a USO tour to Iraq and Kuwait in June to connect with deployed troops. Falcons center, Alex Mack, stands strong with a service member in Iraq. Saints running back Mark Ingram joined Ben Garland, Carlos Dunlap, Latavius Murray, Mario Addison and Rex Ryan for an overseas USO tour as part of NFL's Salute to Service. Ingram shared a meal with service members. The cast of Marvel's Runaways came together to show their support for service members and their families. Pictured above (left to right): Kevin Weisman, Angel Parker, Annie Wersching, Brigid Brannagh, Ever Carradine, Brittany Ishibashi, Ryan Sands and James Yaegashi. Coach Monty Williams, NBA Legend Kevin Martin & WNBA Legend Ruthie Bolton traveled on the latest USO-NBA Cares Hoops For Troops tour. Along with visiting active duty military, the group also coached service members in a basketball game and attended an NBA Finals party on base. Thank you to the celebrity supporters who have joined USO in bringing Americans closer together with our service community this Military Appreciation Month! Tony Goldwyn, Kristin Chenoweth, Conan O'Brien and Felicity Huffman are just some of the entertainers that have worn the limited-edition tee. While visiting service members in South Korea, entertainers on the #USOViceTour visited Imjingak, which is home to "The Bridge of Freedom"; where 12,773 Korean POWs were returned in 1953. Entertainers participated in a USO Operation Birthday Cake surprise for Airman 1st Class Austin Horsting, whose mother also surprised him by traveling to Osan Air Base. The group poses together for a birthday picture to remember. UFC Stars, Paige VanZant and Max "Blessed" Holloway, had some fun with a young fan during the #USOViceTour. Holloway and the young fan "faced off" at Yokota Air Base. Activision and the Call of Duty Endowment introduced the newest "Call of Duty: WWII" DLC Pack, "The War Machine," to service members overseas with opportunities to play with family members and friends at home. 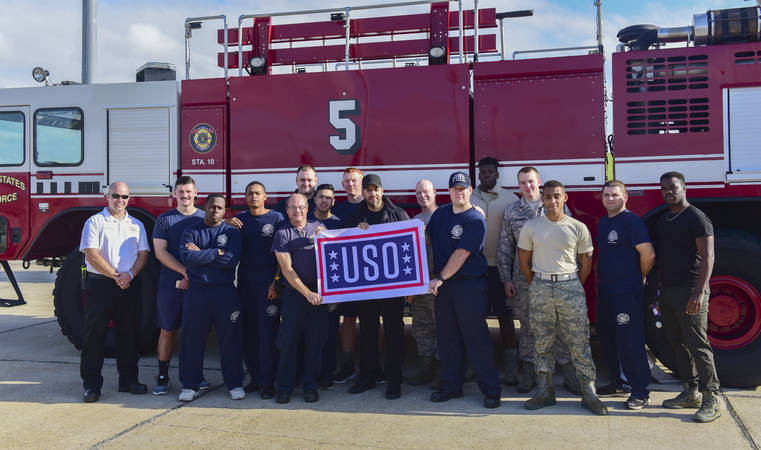 The USO tour traveled to military bases in Germany and Kuwait. Gabby Douglas spent time visiting with service members and their families during her USO tour to Guam and Hawaii. The #USOTour2017 was a huge success! Special thanks to @mikethemiz, @thefoxxyone, @ilizas, @chefirvine, @andybovine, @jrodfromoz, @florent.groberg and so many more who spent the holidays with service members overseas. Thanks to comedians like Iliza Shlesinger, there was no shortage of laughter during the 2017 Chairman's Holiday Tour! What better way to capture the USO tour experience than to take a selfie? Troops Get an Early Screening of "Jumanji"
USO and Sony Pictures treated service members and military families to an early screening of “Jumanji: Welcome to the Jungle” with a special visit from one of the film's stars, Dwayne "The Rock" Johnson. Milo Ventimiglia Announces the Volunteers of the Year! Follow along on social to keep up with USO tours! Stars from music, comedy, sports, film and television joined forces to deliver a message to our troops and thank them for all they do to protect our country. This year, the USO is expanding the Holidays for Heroes program, reaching military members deployed in remote areas in the Pacific, Southwest Asia, Europe and the United States! Show Your Gratitude For Our Service Members by Sending a Message Today. While the entertainment industry has changed a lot over the years, a few things have not. Today's service men and women still long for family, home and country, and they are still delighted and inspired when their personal heroes volunteer their time, voice and reach to work with USO and engage with service members and their families. Support from their favorite entertainers strengthens service members and their families by keeping them connected to the people, places and things they love. USO's tradition of supporting service members stretches back to our beginnings in 1941. 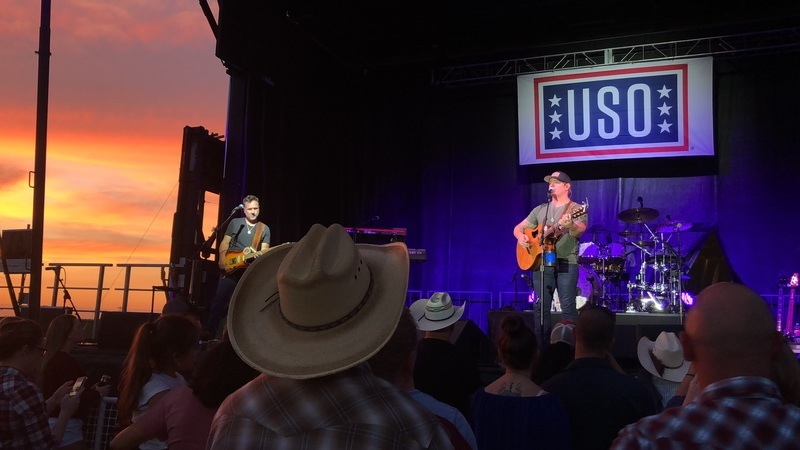 In an effort to boost our military's morale, USO teamed up with some of our country's brightest stars to produce concerts, meet-and-greets and other interactive events for our service members at home and overseas.